Blackberries (Ribes fruticosus) are popular eaten fresh or made into jams, jellies or pastry fillers. When blackberries first develop, they are bright red and taste gritty and bitter. Once they mature, their pigment is dark purple to nearly black, and the flesh is juicy and sweet. Humans aren't the only fans of these fruits; birds, deer, raccoons and even bears feed on the berries. The structure of blackberries is similar to that of raspberries. While we may called the fruit a "berry," it truly is a clustered, cohesive cluster of many tiny fruits. Thus, a blackberry is often regarded as an aggregate fruit. Upwards of 60 to 100 tiny fruits comprise a ripe blackberry, according to Cornell University. The tiny fruits or small dots within the blackberry are botanically known as drupelets. They have the same structure as drupe fruits like cherries or peaches, but on a much smaller scale. Close examination of an individual drupelet within the blackberry reveals a tiny seed with fleshy and juicy mesocarp and a thin skin or exocarp. The drupelet arises from the pollination and fertilization of an ovary on the blackberry's flower. There are two chambers or ovules in each ovary, but one aborts and allows the other to ripen to form a blackberry fruit mass about four weeks after bees pollinate the blossom. Wash berries and pick over, removing unripe berries, leaves and any dirt. Put berries in a blender and puree. Add water--1/4 to 1/2 cup--if necessary to get the berries going. Strain with a fine mesh strainer to remove seeds. Push the remaining berry puree through the strainer with the back of a spoon to get the last bits. Add 4 tbsp. of cornstarch and 1 1/4 cups of sugar to each 4 cups of blackberry puree for the pie filling. Add 1/4 cup of sugar to each cup of washed and cleaned berries. Mix well. Mash the berries slightly to release some juice. Let the berries sit at room temperature for an hour. The berries should become very juicy as the sugar draws out the juice. If there's not enough, add 1/2 cup of water to each cup of sugared blackberries. Cook over slow heat until berries come to a boil and start bursting. Sieve the berry mixture to remove the seeds. Apply the shredded mulch around the canes and between the rows in a thick layer to cover the entire soil area. Make the mulch layer between 2 and 4 inches thick. Keep the mulch from touching the canes directly by keeping the mulch layer approximately 2 inches away from the base of each cane. Replenish the mulch throughout the growing season to keep the thickness uniform. This will help keep weeds from growing and will help the soil stay evenly moist. Add additional mulch each spring at the beginning of the growing season to keep the mulch between 2 and 4 inches around the canes. Bury the tip of new blackberry canes in the soil near the mother plant. This should be done in early September. Take care not to break the canes when bending them. Make sure the soil is tamped down tightly over the tips of the canes. It needs to be tight enough to hold all winter. In the spring, dig up the rooted cane tips. This should be done in mid-March if the soil is not frozen or waterlogged. Cut the rooted canes from the mother plant. Prune the canes so that only two or three buds remain. Place each thornless blackberry cane's roots in the soil, tap the earth down firmly around the roots and water thoroughly. When planting, the crown of the roots should be level with the soil surface. Trim each cane so that it is about 10 inches high. Water the new plants with one inch of water each week during the growing season. Provide a trellis for your growing blackberry plant as it gets taller. Harvest your first blackberries during the transplant's second summer of growth. Pick the berries every few days. You may have to harvest more often if birds start to take in your crop before you do. Store fresh blackberries at room temperature immediately after picking. Blackberries can be stored at room temperature for one or two days. Spread blackberries on a single layer on a baking sheet. Pick out and discard any berries that appear overly soft or appear to be spoiling. Place the berries in the refrigerator on the baking sheet and use within several days. Place the blackberries in a colander and wash them under cold running water. Cut out the hulls, if desired. Allow the berries to drain for approximately 15 minutes and then spread the blackberries on a single layer on a baking sheet and place them in the freezer. Allow the blackberries to freeze on the baking sheet for approximately two hours. Remove from the freezer, and place the individually frozen berries into a plastic freezer bag. Seal the bag and freeze for up to 10 months. Blackberries have been used for thousands of years in Europe, and have been written in early British folklore. It was used as a gout remedy by Ancient Greeks. The fruits are native to North America, Europe, Asia and South America. Blackberries have a high tannin content, making them good astringents. They can potentially aid diarrhea, and decrease bleeding. Germans have used it for sore throats, irritations and infections. Some types of blackberries have anti-tumor properties. Blackberries are aggregate fruits with their clusters of individual fruits, or druplets, similar to those of a raspberry. The rose is a relative of the wild blackberry. Blackberries boast antioxidant properties. This is what gives the blackberry its deep, dark color. They are a natural source of salicylate, or the substance used in aspirin. They also are a good source of soluble fiber. Typically blackberries are eaten as fresh fruit (frozen, or canned as well). They're also frequently used in pies and cobblers. A wine exists that is made from blackberries. Other methods are jams, jellies and syrups. Focus on plants that actually have berries on them, which is usually from late summer to fall. Unripe blackberries appear red; the time when they ripen is when they achieve their black color. Examine the leaves. Blackberry plants are bushy and can grow anywhere from 3 to 8 feet high, with leaves that are ovals, split up into three to five separate leaves. The plants also usually spread over the ground or up something, such as a tree or fence. Look for thorns on the plant. Blackberry plants have short thorns on their stem. The plants also have multiple arching stems. Look for the flowers on the plant, which will bloom from spring to summer. These flowers are small, whitish pink, has five petals and grow in clusters. Choose a site that is well-drained but retains moisture, such as a sandy loam. Do not use a site where potatoes, tomatoes, pepper, eggplant or strawberries have grown within the past three years, according to Kansas State University, because the fungus disease verticillium wilt may exist in the soil and infect your plants through the roots. A site located away from strong winds will help reduce cane breakage and increase fruit production, KSU says. Add humus to sandy soils before planting, and place a handful of compost in the bottom of each planting hole. Keep your plants in a bucket of water during the planting process to keep roots moist. Place your plants 4 inches deeper than they were in the nursery row; look for a dark gray line on the lower stem area, KSU says. Spread the roots out within the hole, and backfill the soil. Tamp down firmly to remove air pockets, then water deeply. Cut your blackberries back to about 6 inches immediately after planting. Mulch your young plants only in the late summer, after plants are established. Water weekly if there has not been adequate rainfall. Choose a location for planting. Blackberries should be grown in a site that gets plenty of sun and provides well-draining soil. Dig a hole large enough to accommodate the plant's entire root structure. Place the first of your plants in the hole, allowing the roots to spread out naturally. Fill in the hole, making sure to pack the soil firmly so no air bubbles remain. Repeat steps 2 to 4 for additional plants, spacing them 4 feet to 10 feet apart if you are growing trailing cultivars; 4 feet to 6 feet apart if you are planting erect cultivars. Rows of blackberry plants should be spaced 8 feet to 10 feet apart. Water the newly planted blackberry plants thoroughly so they can begin to establish their roots in their new location. Purchase a chemical herbicide for usage on brambles. The New Jersey Agricultural Experiment Station recommends the use of Roundup as a spot treatment for brambles. Put on gloves, eye protection and clothing that covers the arms and legs. Spray the brambles using care to avoid the surrounding grass. Roundup is a non-selective herbicide, which means it will kill any plant it lands on. The ideal day for spraying features little wind and no chance of rain. Remove the blackberry canes by bush hogging or cutting by hand. Pluck the stems from the fresh blackberries. Rinse the berries under cold running water to remove any dirt or debris on the fruit. Turn on your oven and set the temperature to 140 degrees F.
Spray a cookie sheet with nonstick cooking spray. Scatter the washed blackberries on the cookie sheet. Arrange the berries so that they are not touching each other. Position an oven-safe thermometer on the cookie sheet and put the cookie sheet in the oven. Keep the oven door open approximately 6 inches to let the humid air inside escape. Review the thermometer. Because the oven door is open, the temperature inside may fluctuate. Adjust the oven's thermostat to keep the temperature inside at 140 degrees F.
Remove the blackberries when they are shriveled in appearance and chewy in texture. This will take several hours, depending on the size of the blackberries, their moisture content and the general humidity of your home. Use a lawn mower or a string trimmer to cut down the wild blackberry canes as they begin to emerge in the spring. Cut down all traces of the blackberry stems. Use a shovel to dig up as many of the crowns and roots of the blackberry plants as possible. Dispose of these roots in the garbage or another place where they cannot take root again. Continue to mow and dig up roots during the summer months. Blackberries can grow from small bits of root left in the ground, so digging up the roots will be an ongoing process during the summer. Spray the area with brush control herbicide in the late fall before the first frost. Depending on how heavy the wild blackberry growth is, you may need to apply the herbicide several times during the fall to kill the plants. Blackberries typically ripen in June in southern locations and July in northern areas. Different varieties of blackberries are available that can ripen early in the season or later. 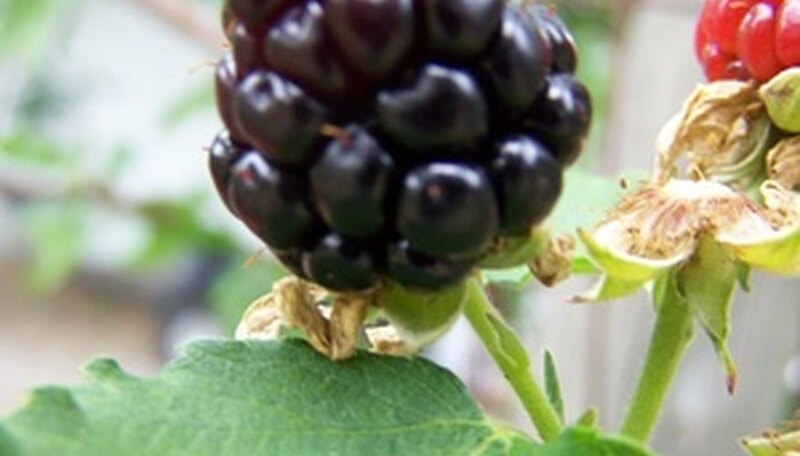 Blackberry plants are vigorous; their canes quickly root and establish new bushes. Prune blackberries and train canes on trellises. Rotate tomatoes and peppers with other plants annually and grow varieties resistant to verticillium root rot. Cut several pencil-thick blackberry roots that are 3 to 6 inches long. Take the cuttings in the fall, when the plant is losing its leaves and beginning to go dormant. Place the root cuttings in a plastic baggie along with some damp peat moss. Seal the baggie and place it in the vegetable crisper of your refrigerator and leave it there until the following spring. Remove the baggie from your refrigerator once all possibility of frost is gone from your area. Allow the cuttings to thaw on a damp paper towel overnight. Choose a sunny, well-drained location. Loosen the soil in your garden and mix potting soil with your garden soil until the mixture is approximately 50/50. Make 1-inch-deep trenches in the soil and lay the blackberry roots horizontally in each trench and gently cover with soil. Plant roots 3 feet apart with rows at least 18 inches apart. Water the soil gently but thoroughly. Keep the soil damp but not soggy. Your blackberries should begin to sprout within 14 to 21 days. Measure the length of your row of trailing blackberries. Dig a 2 foot deep hole at either end of the row. Add a layer of gravel to the bottom of each hole. Place a 4-inch by 4-inch treated wood post that is 8 feet long into each hole and backfill soil around them so they are planted securely. Measure 20 feet from one post and dig another 2 foot deep hole. Add gravel to the hole and place a 2-inch by 2-inch treated wood post that is 8 feet long into the hole. Fill around it securely with soil. Repeat this step along the length of your row of blackberries, placing a post every 20 feet. Unravel 3 feet of 12-gauge wire from the spool. Do not cut the wire. Wrap the wire securely around one of the end posts at about 5 feet from the ground. Unravel and stretch the wire 20 feet to the next post. Wrap the wire around the post. Continue unraveling and stretching the wire around all of the posts until it ends at the other 4-inch by 4-inch post. Wrap the wire securely around the post and cut it from the spool. Repeat Step 5, but place the wire 18 inches below the first wire on the post.